Neil from Salty Towers Oceanfront Cottages reports that plenty of big Chinook Salmon have come onto the dock in the last week. Greg brought a hockey bag full back to North Battleford, Saskatchewan. 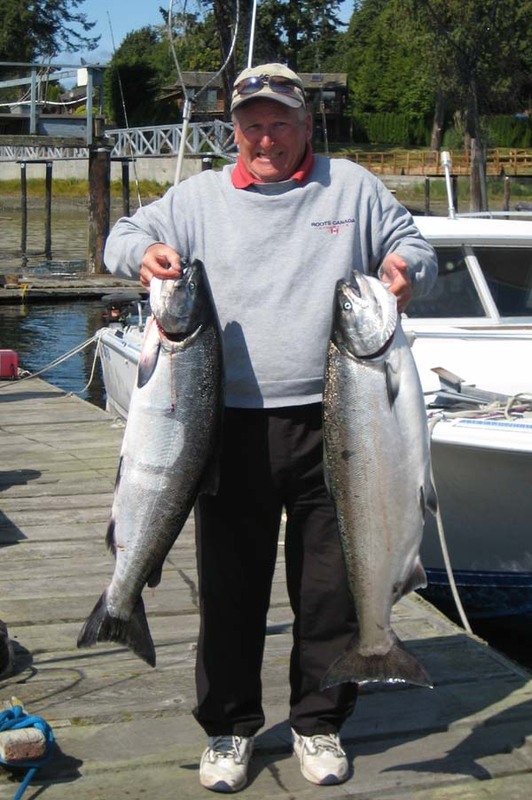 He says that Coho are showing up in larger numbers each day and a few big Chum have been caught lately. Roy from Blue Wolf Charters posted a pic of this beauty caught this week at Sheringham. That's Karen with her first ever Chinook, an 18 pounder. The day before Mazel from Victoria caught this 44 pounder at Otter Point. Other reports this weekend describe Sooke fishing as spotty, some anglers returning with limits and lots of others coming back empty handed. Otter Point and spots west in the afternoon seem to be the best call.